This is a foreign exchange guide to Samoa, the Samoan Tala currency plus WST transfers and travel tips. Samoan Tala exchange rates - latest & historic exchange rates. What is the Samoan Tala currency code and symbol? The three letter currency code for the Samoan Tala is WST and the symbol is WS$. Which countries use the Samoan Tala? It is the domestic currency in Samoa. The interactive chart below shows the USD to WST exchange rate for the previous 3 months with rate alerts for days when the exchange rate moved up or down significantly or for 30 day highs and lows. Geographically and culturally, this small nation is considered the heart of Polynesia. Though the missionaries of the 1800s were enormously influential, the country has nevertheless clung to Fa’a Samoa (the Samoan Way), making it one of the most authentic and traditional of all Pacific societies: in some parts of the islands you’re more likely to see someone juggling fire than a house with walls. 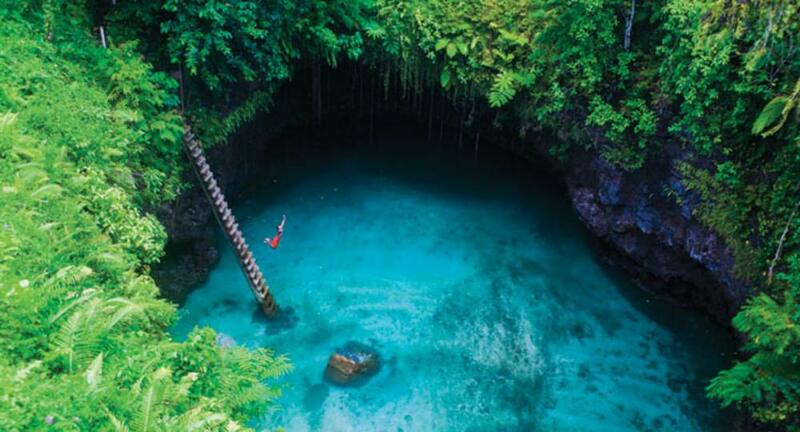 Despite its isolation, Samoa offers accessible adventures. From the relative ruckus of Apia to the soul-stirring silence of Savai’i, you’ll find a paradise that is safe, sweet and easy to get around. The Samoa decimal currency is the Tala (dollar) and Sene (cent): 100 Sene = ST$1 (Tala). All major foreign currencies are exchangeable in Samoa. ATMs are located in and around Apia and on the island of Savai'i. Travellers can use credit cards in the machines but you are required to have a PIN number to withdraw cash. Eftpos machines are found throughout Upolu and Savaii in major hotels, resorts and supermarkets and accept the following cards – Visa, Mastercard, Cirrus, Amex, JCB & Plus Cards and Access International Debit Card.. ANZ and Bank South Pacific are the two international banks found in Samoa. Both have branches at the international airport, in Apia and at Salelologa on Savai'i. National Bank of Samoa and Samoa Commercial Bank provide services, currency exchange and ATMs. How to travel in Samoa? Taxis are abundant around the islands and offer their services at very good value. Taxis are not metered so it’s good to have an idea of what the journey will cost and agree on a price with the driver before setting off. Another fun way to explore the islands – and get to know the locals – is to take a map and board a local bus. All buses are named with their destination, so ask the driver which bus you need to catch. Note that aside from the terminals, there are no designated bus stops, so you will need to wave down a bus. Travelling by public bus in Samoa is an experience in itself. The vibrantly painted, wooden-seated vehicles (more often than not blasting Samoan pop music at deafening volumes) each have their own character. Drivers are often as eccentric as the vehicles, and services operate completely at their whim: if a driver feels like knocking off at 1pm, he does, and passengers counting on the service are left stranded. Never rely on a bus after about 2pm. The Samoa Shipping Corporation runs the passenger/vehicle ferry between the mains islands of Upolu and Savai'i. The ferry departs from the Mulifanua Wharf on Upolu near the international airport, so if you are travelling from Apia, allow 45 minutes for the journey. The ferry from Mulifanua Wharf regularly plies the waters between Upolu and Savai’i. Small boats leave from Cape Fatuosofia for Manono. Getting around by car in Samoa is quite straightforward. The coastal roads on Upolu and Savai'i are sealed; most of the other main roads are pretty good. A 4WD will make trips down rough, unsealed side roads more comfortable, but nearly all of these can be tackled in a high-clearance 2WD (unless there's been heavy rain). Petrol stations are few and far between on both islands. 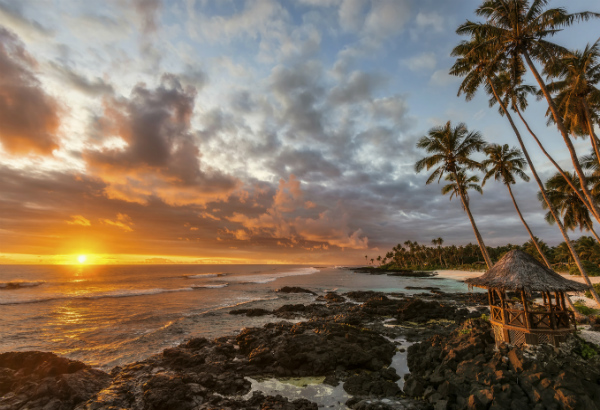 Samoa is a classic tropical destination, with hot and very humid weather throughout the year. There are two seasons in Samoa: the dry season and the wet season, which also brings with it cyclone season. Always keep in mind though: you can’t have all this intense green without plenty of rain! The tropical cyclone season in Western Samoa normally runs from November to April. Take out comprehensive travel and medical insurance before you travel. The official languages in Samoa are Samoan and English. Samoan is a strangely beautiful dialect that you’ll likely not be able to pick up during a short stay aside from talofa (hello) and faafetai (thank you). English is widely spoken in Upolu but in Savaii the story is a bit different, with a lot of villagers only speaking Samoan. It’s also recommended to purchase bottled water for drinking and if you going to drink the tap water in your hotel room (which is generally safe), boil it first and chill in the fridge. Major hotels and resorts also offer internet terminals for guests in their business centres. WiFi is also available at many locations. Save money and time by Ordering your Samoan Tala online from Travelex, you get better rates and can pick up the WST cash locally or even on travel day at the airport. For card purchases if offered a choice of currencies always select to Pay in Samoan Tala otherwise you may get much worst exchange rates. Compare WST travel cash rates - probably why you are here! When searching around for information on how to get a good exchange rate when sending money to Samoa you need to start with finding out the latest Samoan Tala foreign-transfer exchange rate. Once your funds are received by the provider the converted WST amount will be transfered to the recipient account you specify in Samoa. Use our Send to WST calculator to compare the exchange rates of FX specialist providers rates versus your bank's standard rates you can hopefully save around 5% and maybe more - end result is more Samoan Tala deposited into the recipient bank account and less margins and fees kept by the banks!